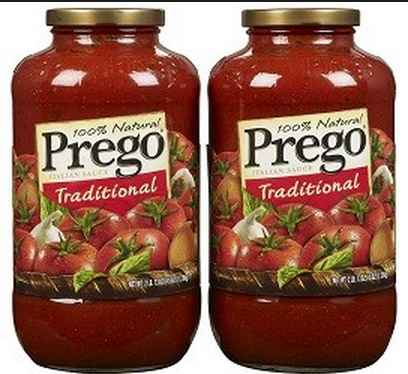 You are here: Home / Great Deals / Recall: Prego Sauces! Campbell is voluntarily recalling a few Prego products. Take a look at the info below a check your pantries. Campbell Soup Company is voluntarily recalling approximately 300 cases of 24-ounce jars of Prego Traditional Italian sauce because of a risk of spoilage. The product subject to the recall was made at the Campbell Soup Supply Company establishment in Paris, Texas and was shipped on December 21, 2013 to retailer distribution centers that serve the following seven states: Arizona, Arkansas, Kansas, Missouri, Nebraska, New Mexico and Oklahoma. This recall is limited to the U.S. The potential spoilage was discovered as a result of the company’s routine quality control testing. This recall does not affect any other Campbell products. No consumer illnesses have been reported to date in connection with this recall. Consumers who have purchased the product should not eat it. Consumers should return the product to the store where the product was purchased for a full refund. Consumers can also call Campbell at 866-270-9303 for more information, Monday through Friday, 9 a.m. to 7 p.m. EST. On Dec. 31, 2013 and Jan. 1, 2014, consumers will be able to leave a message in the Campbell Consumer Hotline voice mail box, and calls will be returned every three hours between 9 a.m. and 12 a.m. EST.